And his team The Soul for winning the Arena Bowl Sunday. That’s who we were rooting for! Jon’s hair is always the champion! And thanx Jon, for that awesome breakfast this morning! Comments Off on Congratz Jon Bon Jovi! 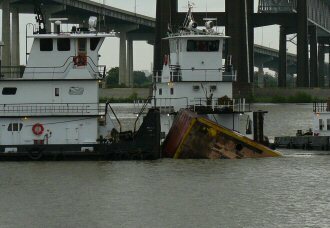 97 miles of the mighty MississiP is closed to due the oil spill yesterday. Nagin said the water is safe but use caution…????? wtf does that mean? can we drink it or not?? The clean up is on-going. I have heard mostly people talking about saving the wildlife surrounding the area. What, the rats?? Is this going to take months and months to clean up as well? The smell is waffing uptown now. It has moved from the cbd and downtown to the uptown area. Most of us can’t even notice. Smell? in New Orleans? really?! Barackstar Obama has finally visited the middle east. Visiting with troups and meeting with leaders. He invited the elite of the press. Guess my invatation was lost in the mail. Mean while, John McCain is hangin with the Bush #1 at his mansion/cottage in Maine. Riding golf carts and eating lobster. I’m not sure what is more dangerous. Being in the middle east or letting Bush #1 drive a golf cart! Actor Christian Bale, who is currently Batman in the awesomest movie ever Dark Knight, and the best movie batman ever, was arrested Sunday night in London for assault. They let him out briefly so he could go to the London premiere of Dark Knight. He has since gone back to the London police and remains in custody. Where is Robin to help bust him out??? My bf’s dog, Zak, has the biggest dog balls ever! He is going on 4 yrs old and my bf won’t get them chopped. It’s time dammit! Zak is the best dog in the world. He is kinda dumb but that is why I love him. His balls overtake any space he is in. And it looks like they hurt him when he runs. Not that I stare, but you just can’t help it! I think one day my bf will come home to find his dog ball-less. It’s time! Or himself ball-less if he doesn’t get the dog chopped already! And it was awesome!!!! If you missed it last night, check out the video we have of it! And make sure you see the repeat episode of it on Comedy Central! It was the first time in 30 years Rush performed live on TV! And who doesn’t love Stephen Colbert???? Rush signed Stephen’s hand before they performed. Stephen asked them- “What is it like to be so awesome?” The band had no reply. We know they’re awesome! Definitly a must have for the Rush fan! Comments Off on Rush on Colbert! John and Obama, are they ok? Is it me or is Obama’s skin getting paler? And McCain’s jowels getting bigger? Is it the stress? Are they eating properly? Getting enough sleep? They both look, well, tired and out of it. Not healthy at all. Running for Pres must be very hard on them physically. Mentally we already know both have issues. Are they working out and exercising? Yoga? Pilates? Free weights? I sure hope they are eating thier vegtables! Comments Off on John and Obama, are they ok? Lets review- Angelina Jolie is the most beautiful woman in all the land. And she has perfect lips. Her twins arrived over the weekend. She has already lost all the baby weight. She has 3 natural kids and 3 adopted kids. She lives in a 70 million dollar mansion in France. She makes block buster movies while saving the planet. She breast feeds while saving refugees from Darfur. And oh ya, she’s married to Brad Pitt. Yup, she’s better than any of us! Ya, THAT guy, the leader of Iran. He is short, sneaky, way dumb, racist, sexist, did I mention he was short? All wack-job leaders in history who were short men- Hitler, Napolean, etc. (you may even be thinking of our own George W right now, who is also short. I wouldn’t put him in the weasle catagory though) Have been WEASLES. And need to be taken out! Is there a connection with being a short man in power and effin the world up??? Over compensating perhaps on thier short-comings? thankfully, both John McCain and Barack Obama are TALL! We should be ok! Big J McGinnis passed away over the weekend. He was a legendary music promoter here in N.O. Most famous for his throw downs at the old Warehouse and of course manager/agent and promoting our friends in the band Zebra. Big J Productions was a force in the music biz for over 40 years. He will be missed. He’s organizing a big show at the pearly gates right now. Rock on Big J!